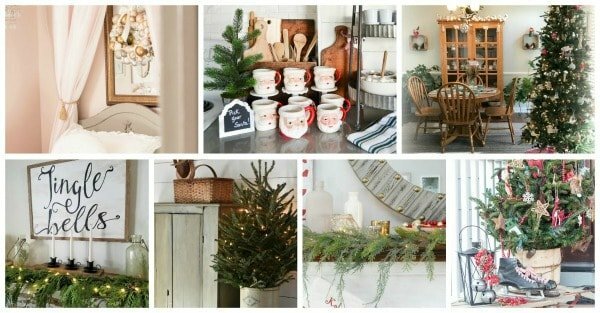 Join me for my 2017 Christmas home tour, combining elegant traditional touches with vintage Christmas collections. 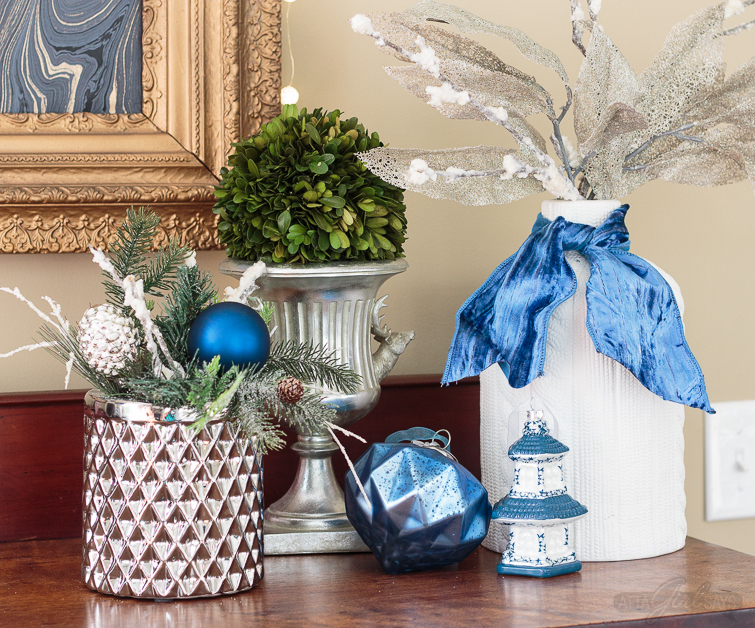 If you love mercury glass, vintage Shiny-Brite ornaments, chinoiserie and antique brass, you’ll love these Christmas decorating ideas. 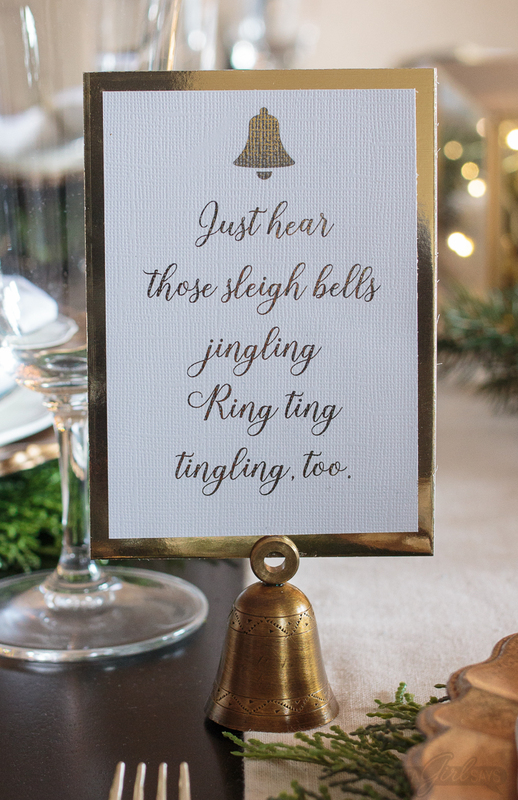 There’s just something so magical about welcoming guests during the holidays. 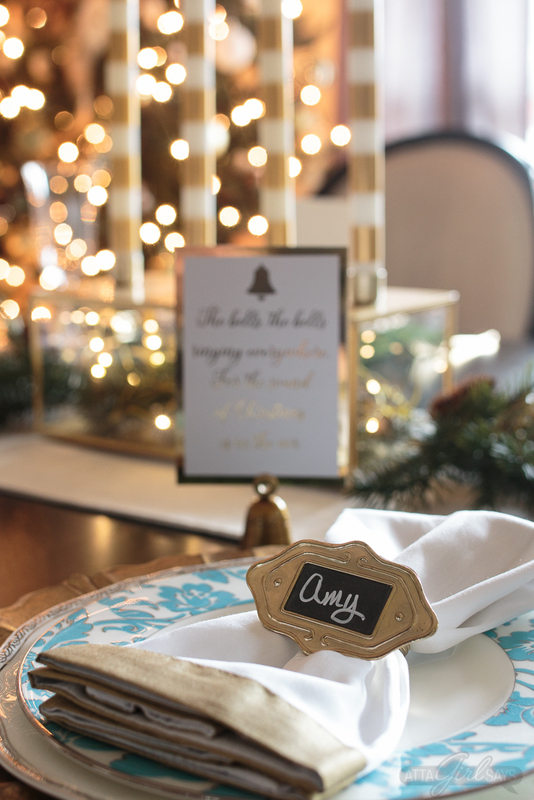 I love spiffing up the place and putting on the sparkle so we can showering friends and family with hospitality during this special season. And I’m so glad you’ve stopped by for a visit today — if only virtually! 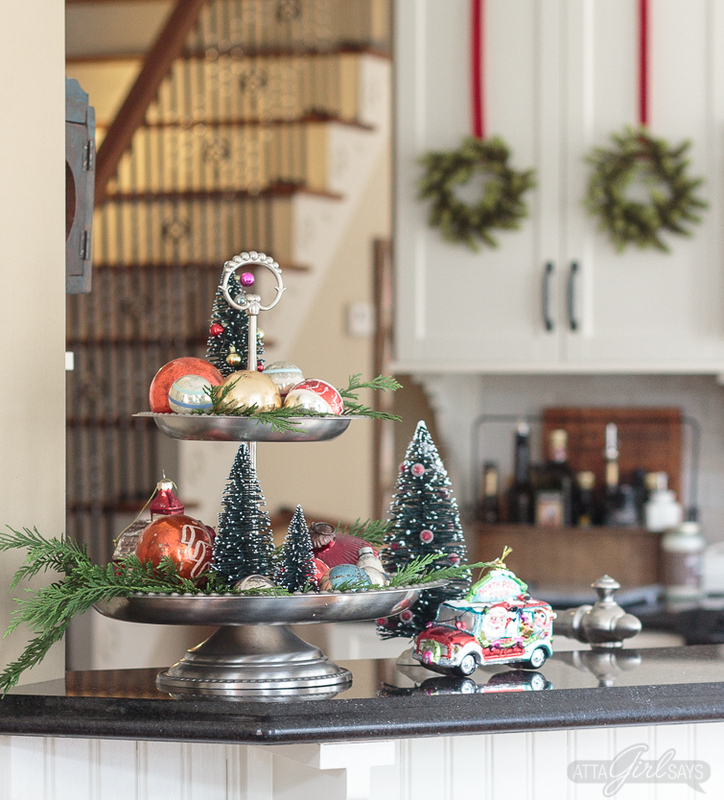 There’s lots I want to show you on my Christmas home tour. 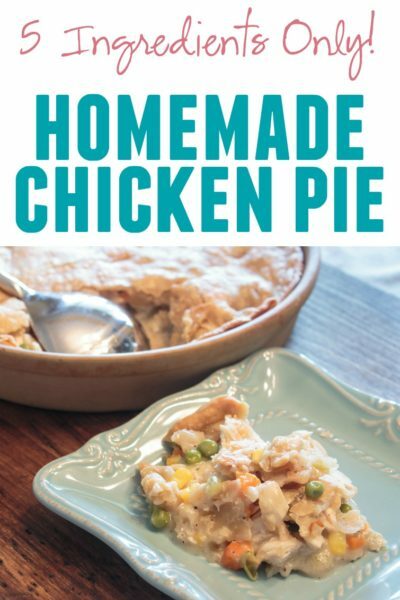 I’m thrilled to be participating in the Home For the Holidays blog tour, organized by Jenna from Wife in Progress. 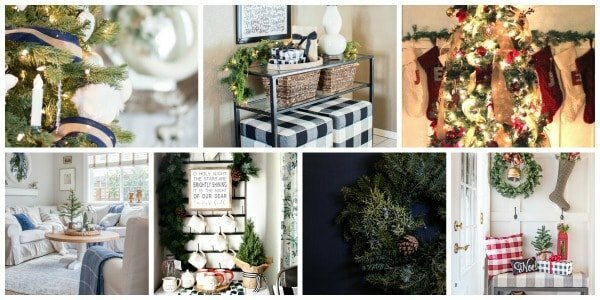 I’m joining 33 other bloggers who are sharing our Christmas decor, in hopes of inspiring you with some creative holiday decorating ideas for your own home. 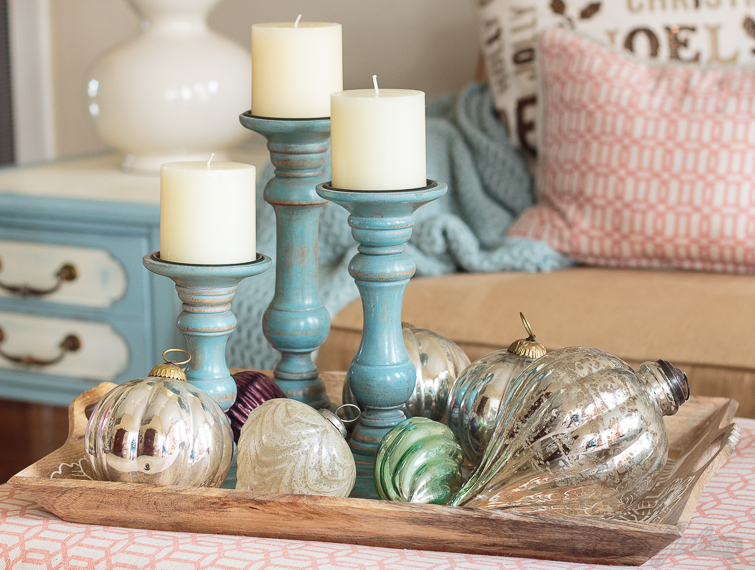 Didn’t you just love touring Meg’s place at Green with Decor? She has such a beautiful home! 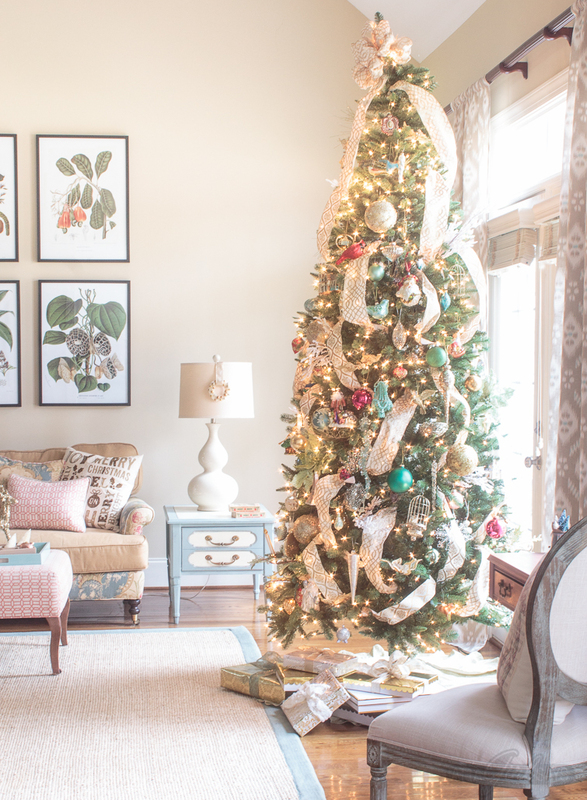 So step in off the front porch, and lets gets this Christmas home tour started. 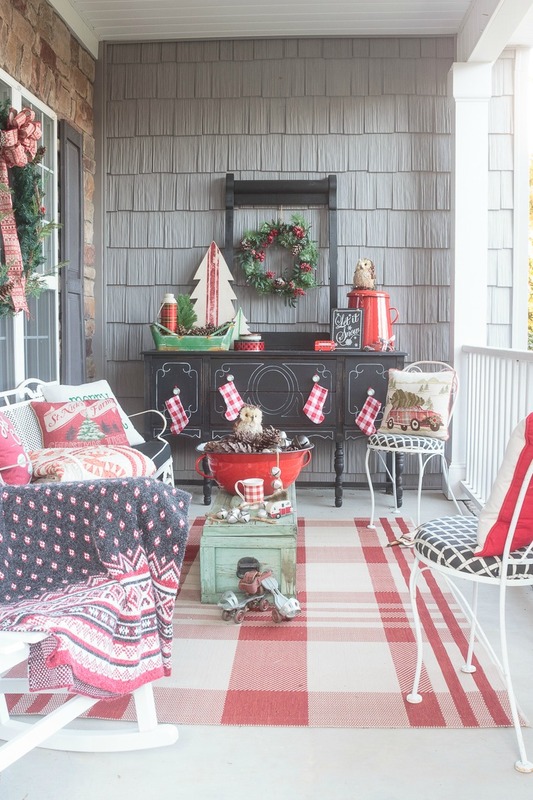 (If you want to see more details from the vintage-inspired front porch, plus the chance to tour 12 other fabulous Christmas porches, check out this post. 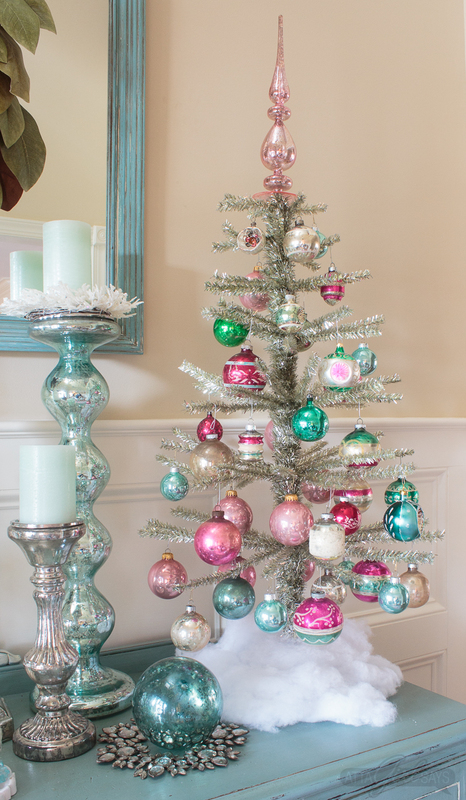 We’ll start in the foyer, which should give you an idea of how much I love color and sparkle and all things vintage. 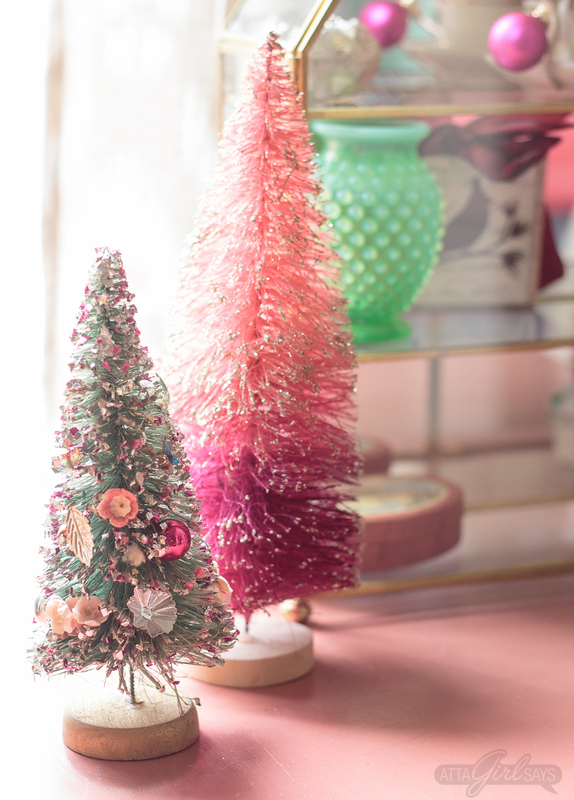 Especially vintage pink and green Shiny-Brites hanging on a pewter tinsel tree. There’s still room. I think I need a few more. I told myself I was scaling back this Christmas, but you see how that turned out. I just can’t do subdued. 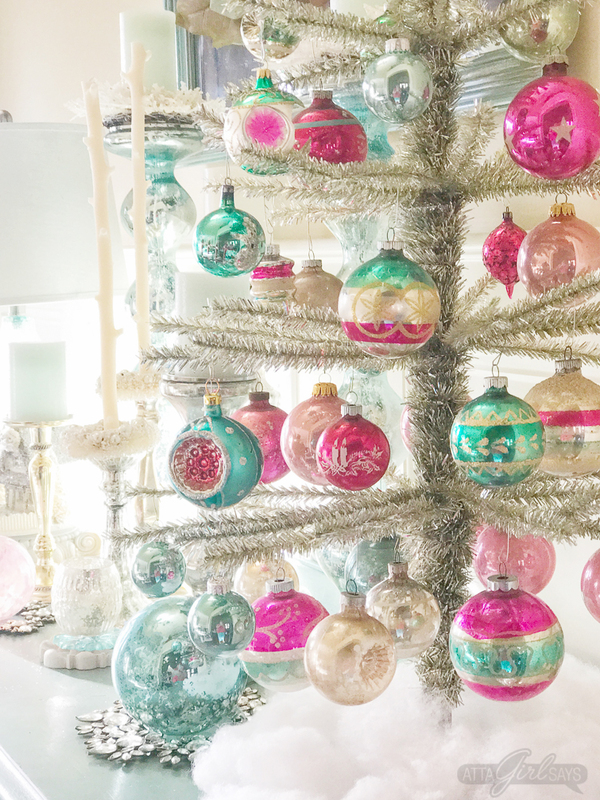 Our family is taking a class this weekend and making handblown Christmas ornaments. 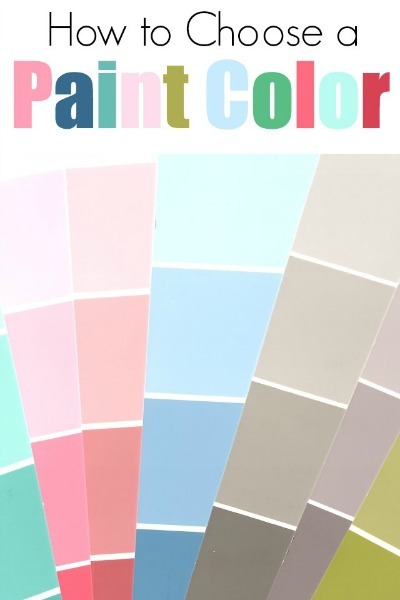 I’m going to try to talk my husband and son into letting me pick the colors! Wonder what I’ll chose! I definitely have a type! 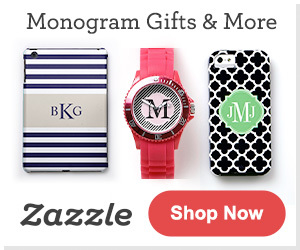 If it’s pink or green or sparkles, I fall head over heels. Off the foyer, you can see our formal dining room. 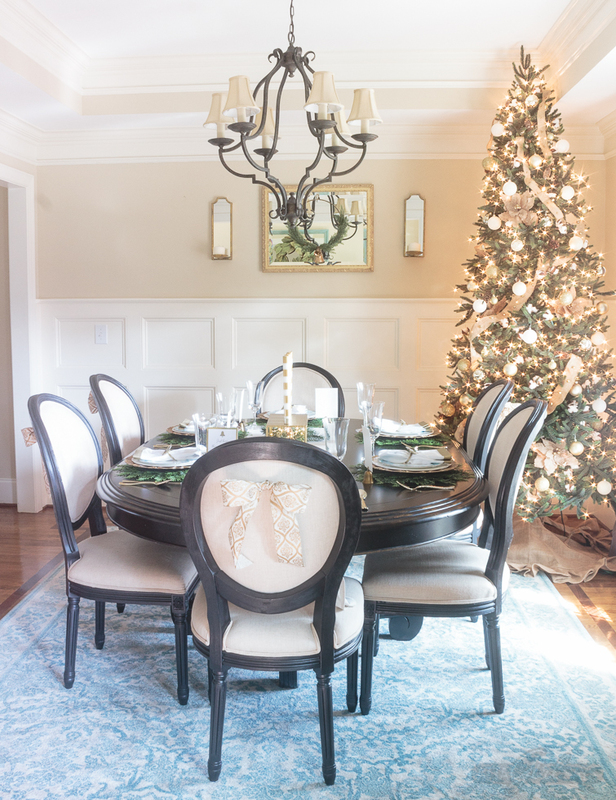 I love traditional decor, and the dining room is a great place for a little formality! I hauled out the wedding china and crystal, but my sterling silverware just wouldn’t do with the golden vibes in here. So I picked up some gold plastic flatware from Target! 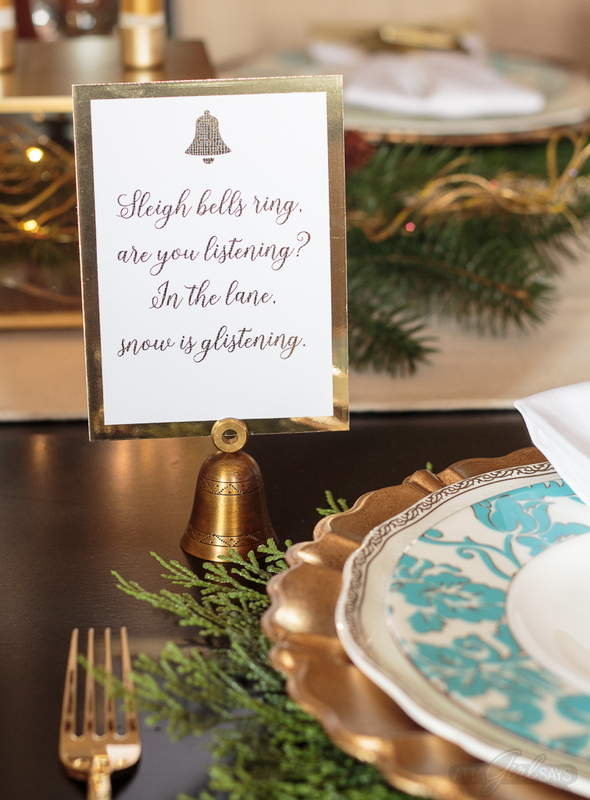 We just look all fancy, with our gold napkins, rings and gilded placecards. And don’t you just love these cedar chargers? I did. 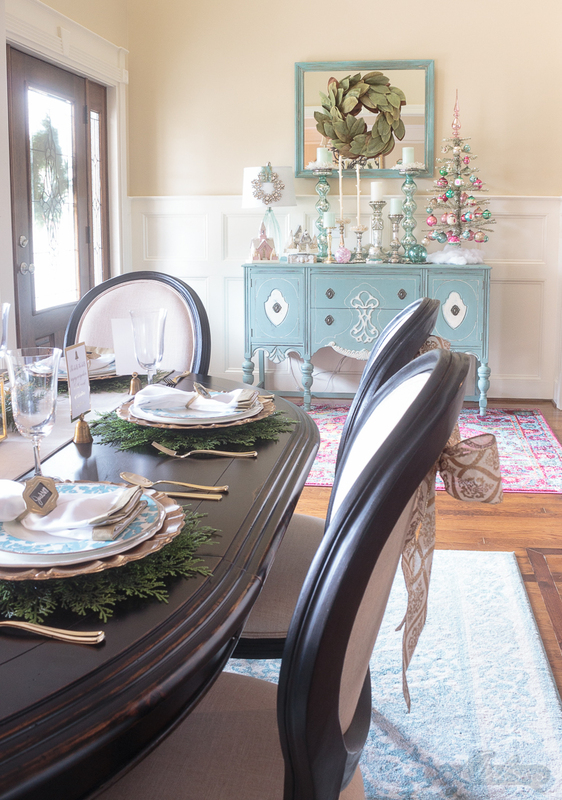 When I saw them on another blogger’s Christmas home tour, I rushed out to Pier 1 to get some for our dining room table. 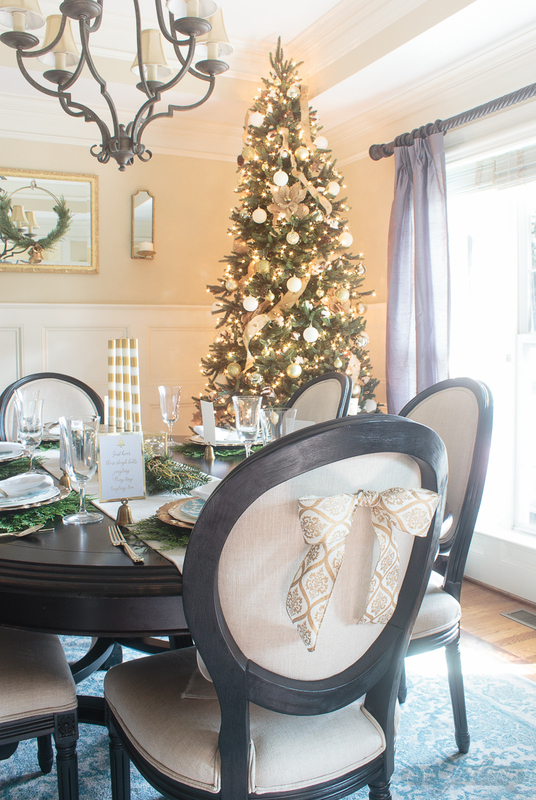 This is the first time we’ve used this 9-foot tree in the dining room. 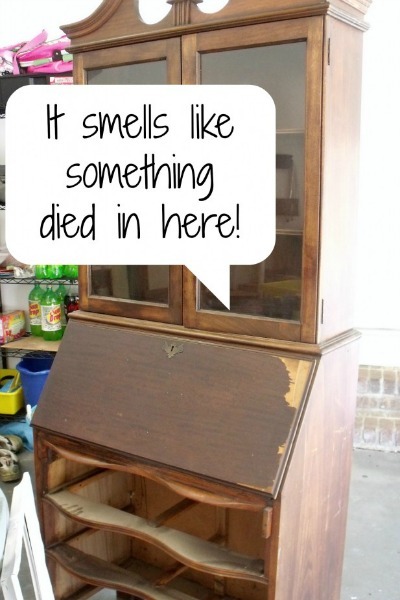 In the past, we’ve used it in our living room. The tree might be a bit tall for the space, but I had to make it work in here so I could hide the burned-out strand of lights against the wall. Always lit? Lies! Before we head into the living room, let’s take a detour to the master bedroom. This was the first space I decorated for Christmas, and it’s the first time we’ve put up a tree in our bedroom. 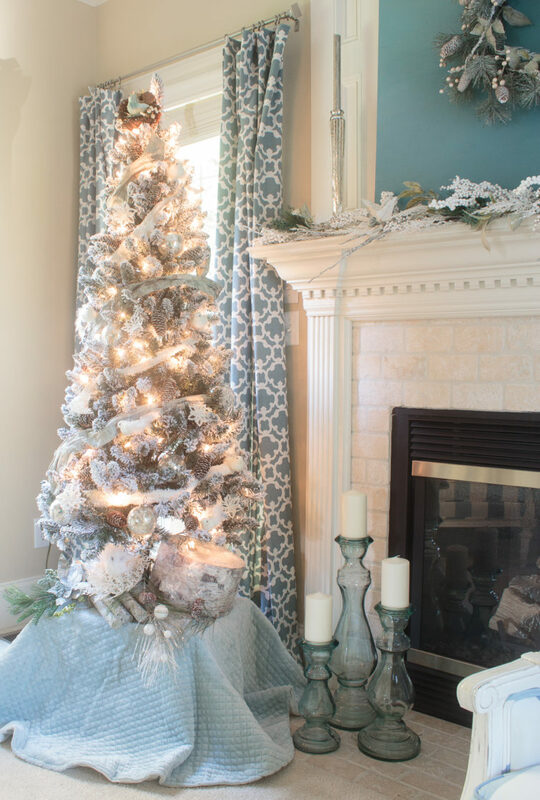 I love how the winter woodland feel the cool blue tones and the snowy white flocked tree give the space. 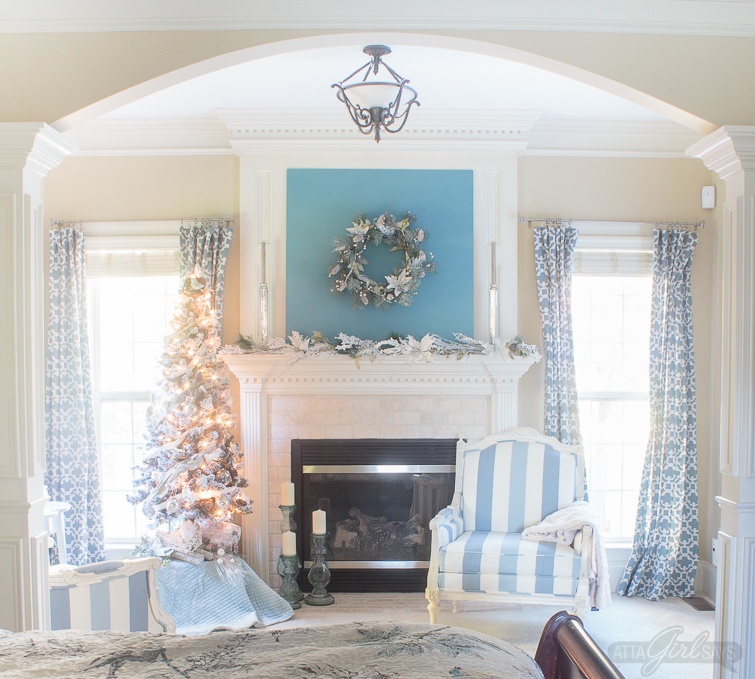 To see more of our master bedroom Christmas decor, check out this post. Now we can head into the living room, where you might spy more of my favorite colors. 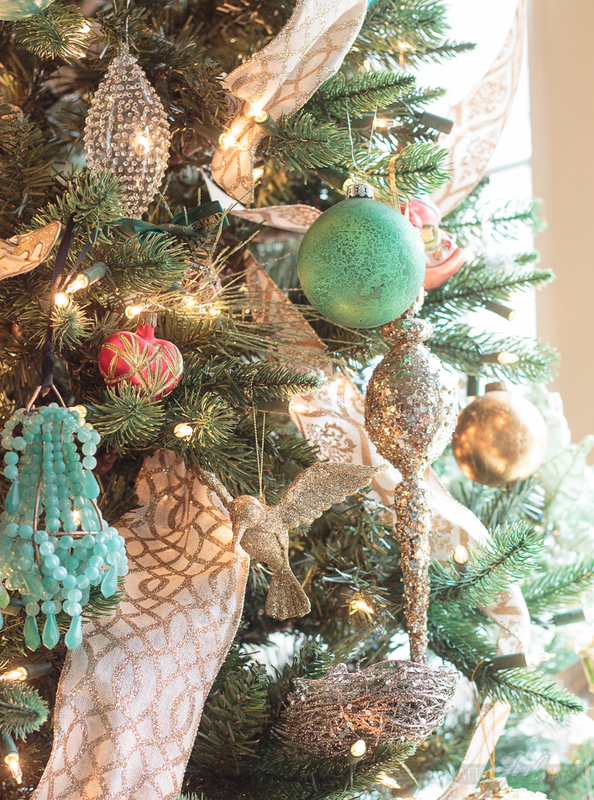 This year, I topped the tree with a big bow and wove two different patterns of gold-and-ivory ribbon through the tree to complement our collection of glittery, sparkly and glass ornaments. My son thinks these boxes are empty, wrapped for blog photos only. 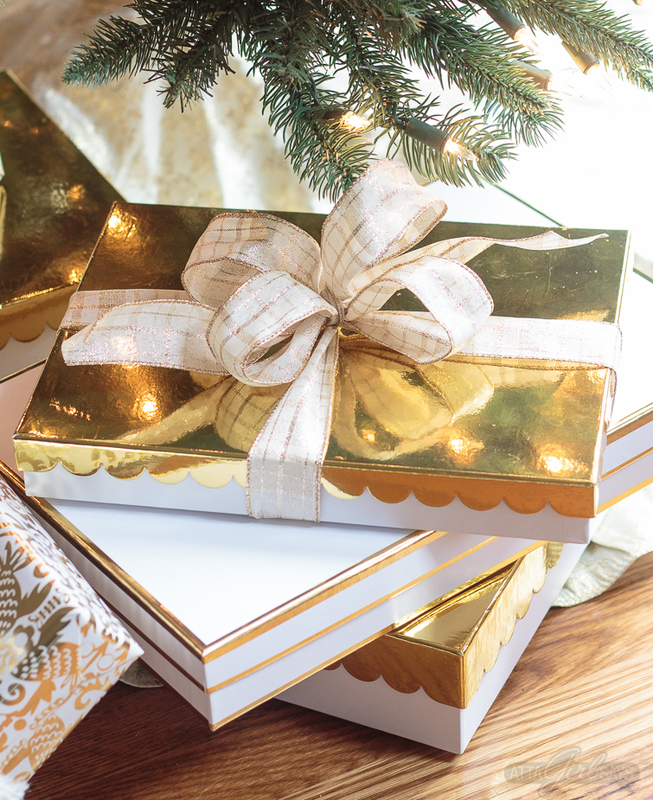 And a few of them are, but there are also a couple of presents for him under the tree. Sneaky mom! Good thing he doesn’t read my blog. 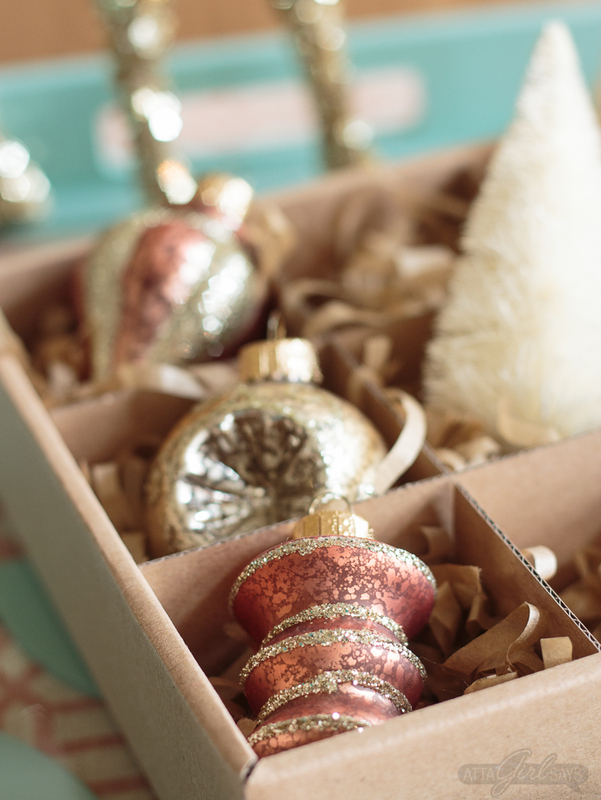 I love to use ornaments throughout my Christmas decor, not just hang them on the tree. And everyone has a story. OK, the story with these is that I wasn’t going to buy anymore ornaments last year. 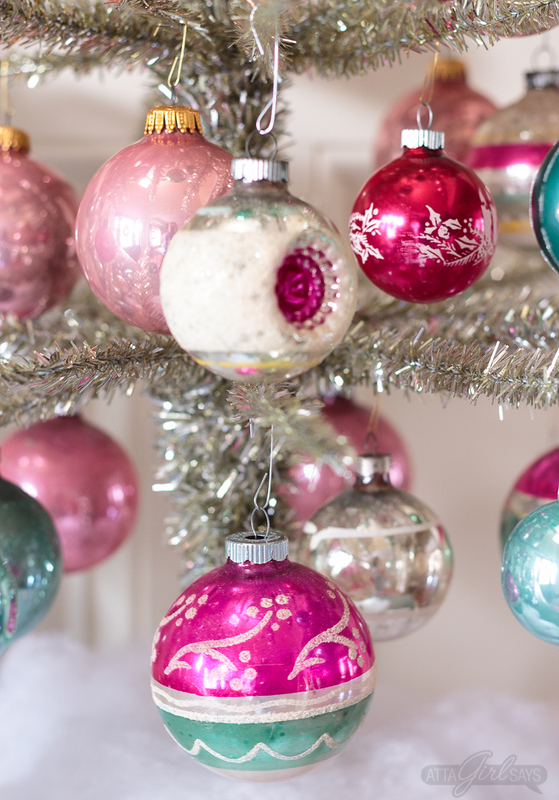 But how could I leave these pink-and-gold beauties on the shelf? 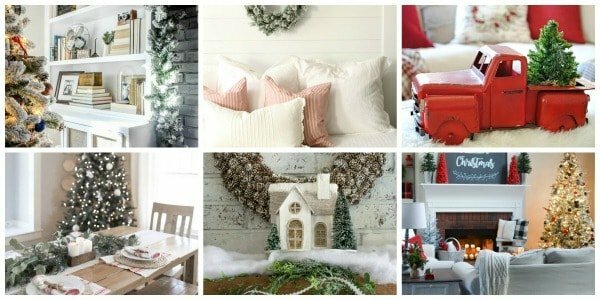 Just a few more Christmas touches sprinkled throughout the room. 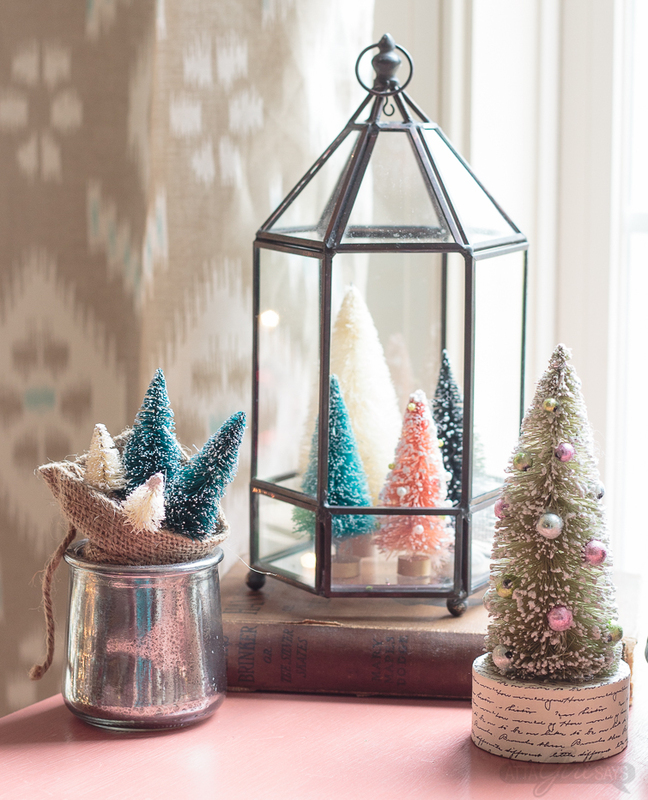 A vintage bottle brush tree alongside a $3 cutie from Bulleye’s Playground at Target. We live in an “open concept” home, and the living room flows into the kitchen/breakfast nook and keeping room. 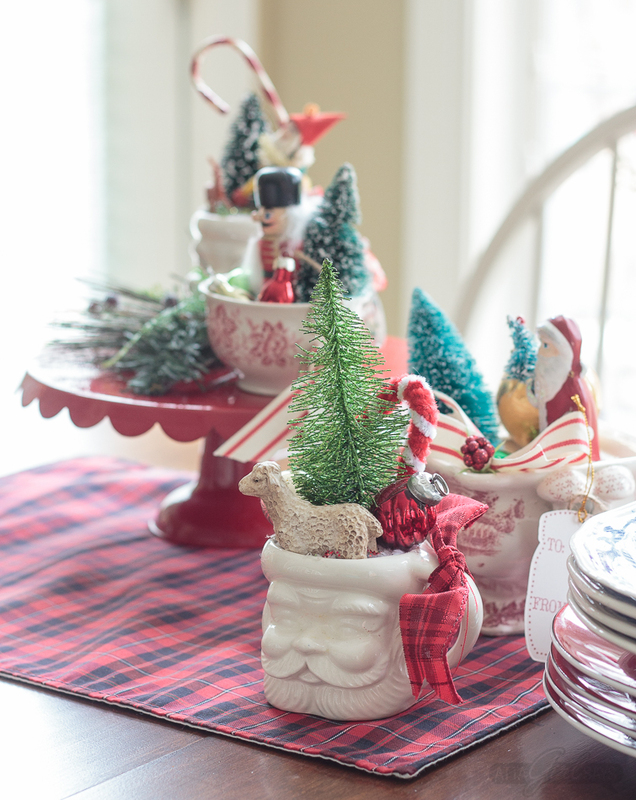 I like too many different things to have a cohesive Christmas theme throughout the house. But I like to think a certain vibe flows from room to room. 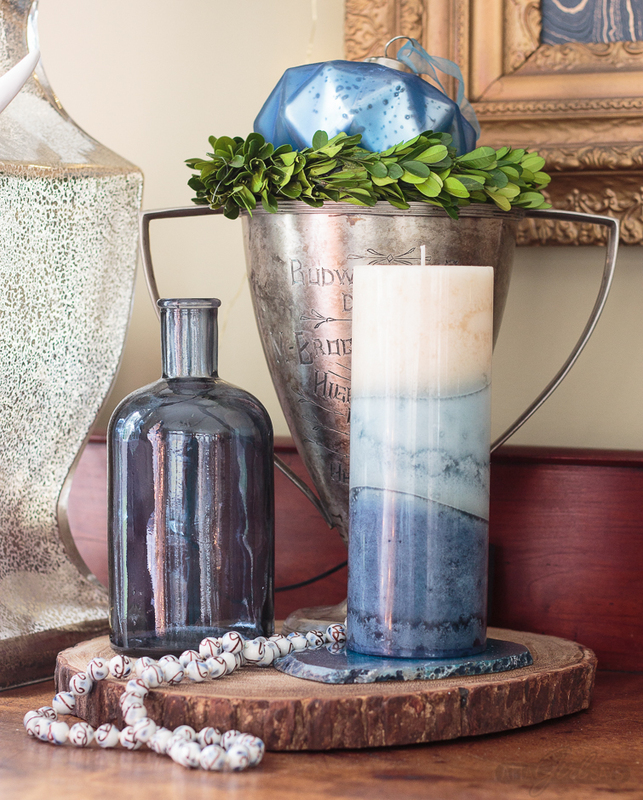 I do try to use some of the same color elements throughout the house, namely pops of aqua blue. I went with a more traditional color scheme in the kitchen and breakfast nook. Lots of red and white with natural greenery. 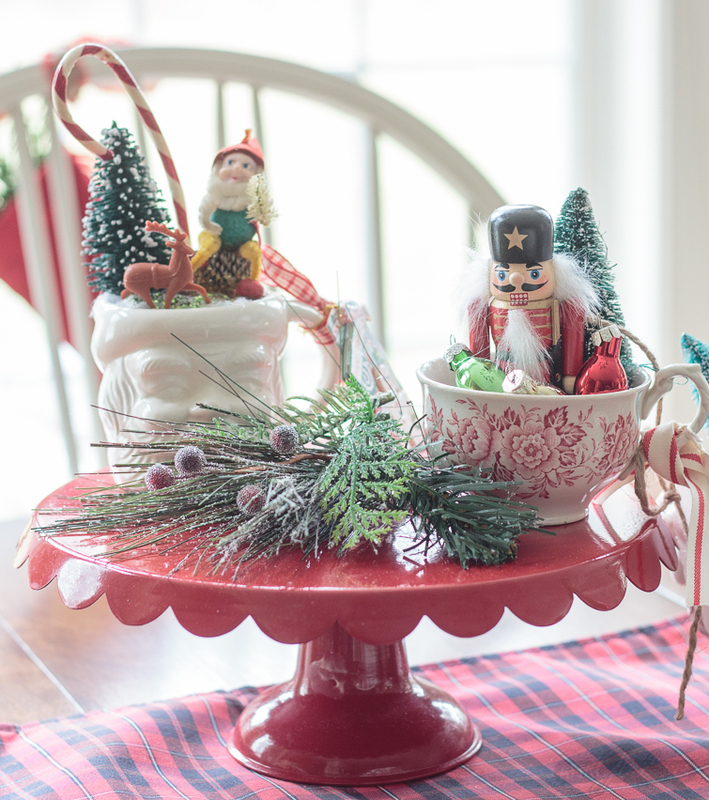 Aren’t these vintage china arrangements just the cutest? 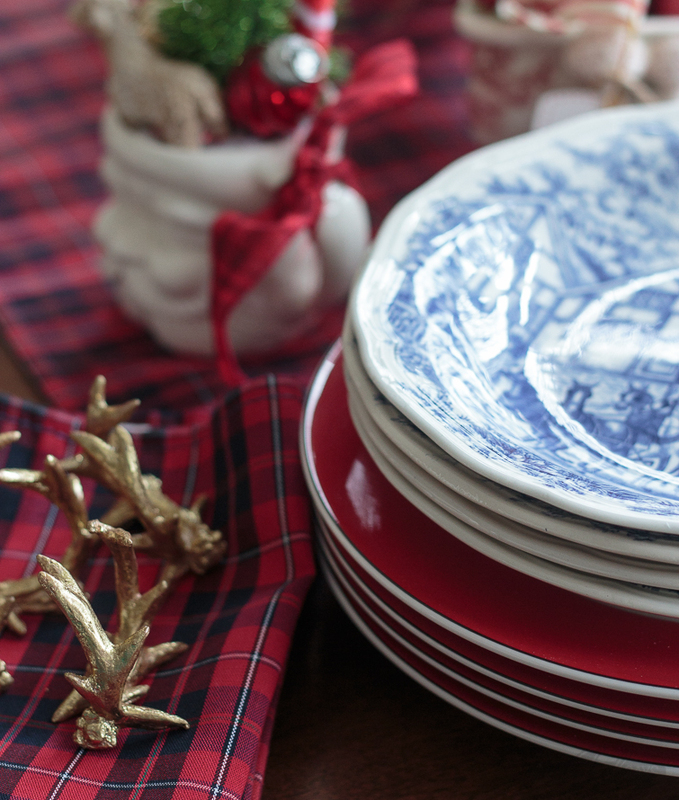 They inspired me to set the table with blue-and-white transferware and red plates. 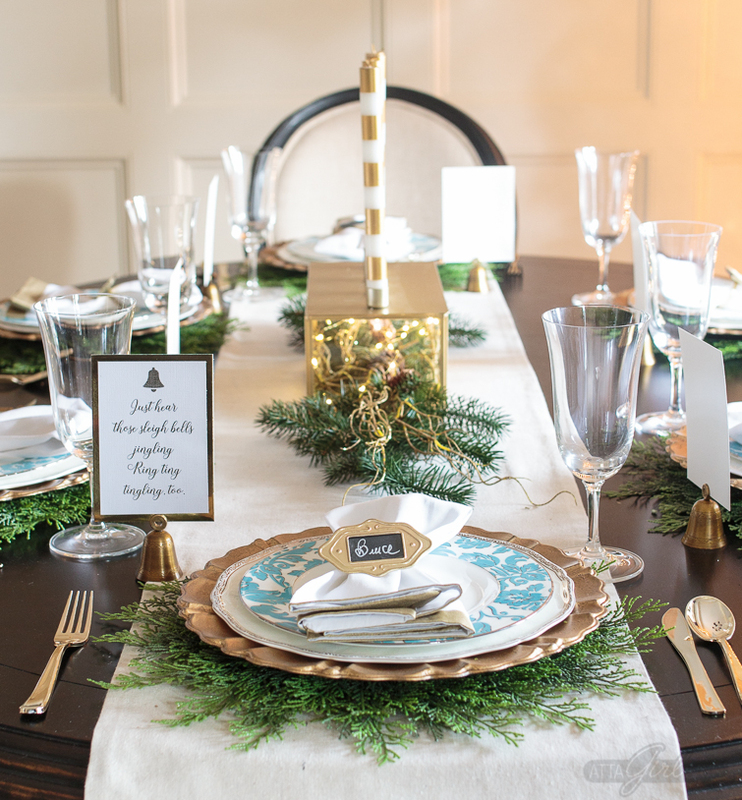 The blue patterned plates coordinate with the blue tones we have in our keeping room. 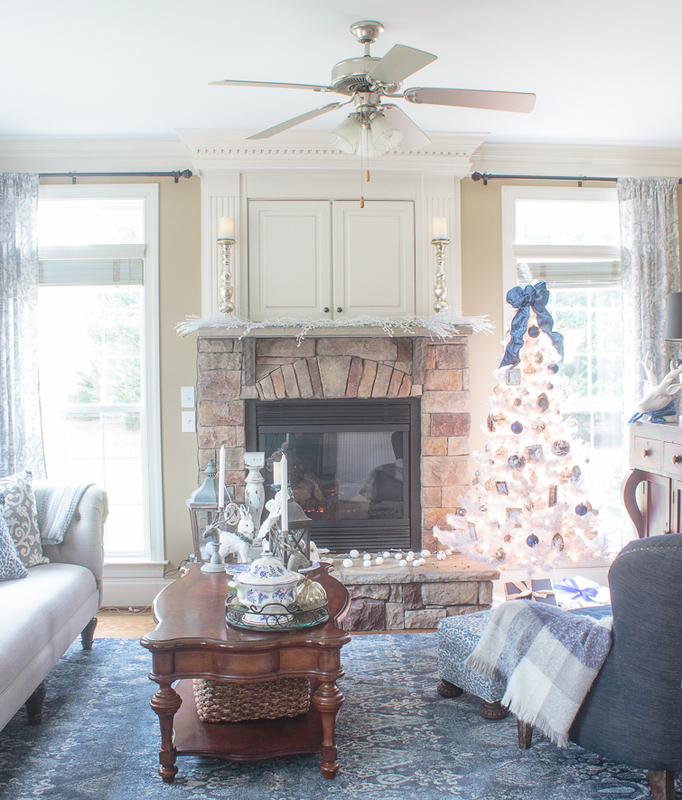 We’ve recently updated this space — new sofa, rug and ottoman — so I decided to use blue, silver, white and gold for our Christmas decor in this cozy family hangout room. Normally, I put up a mass of greenery on the mantel, and it ends up blocking the TV! 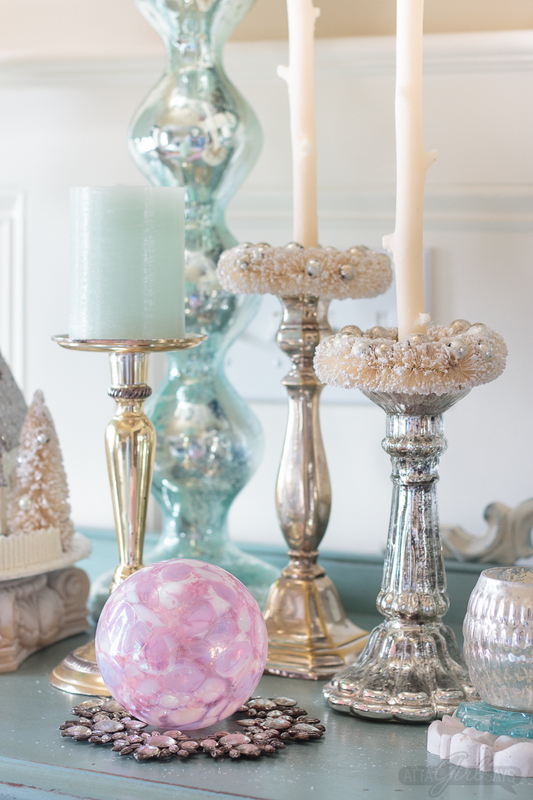 So this year, I kept things simple — just a few icy branches and a pair of mercury glass candlesticks that I can use all year long. 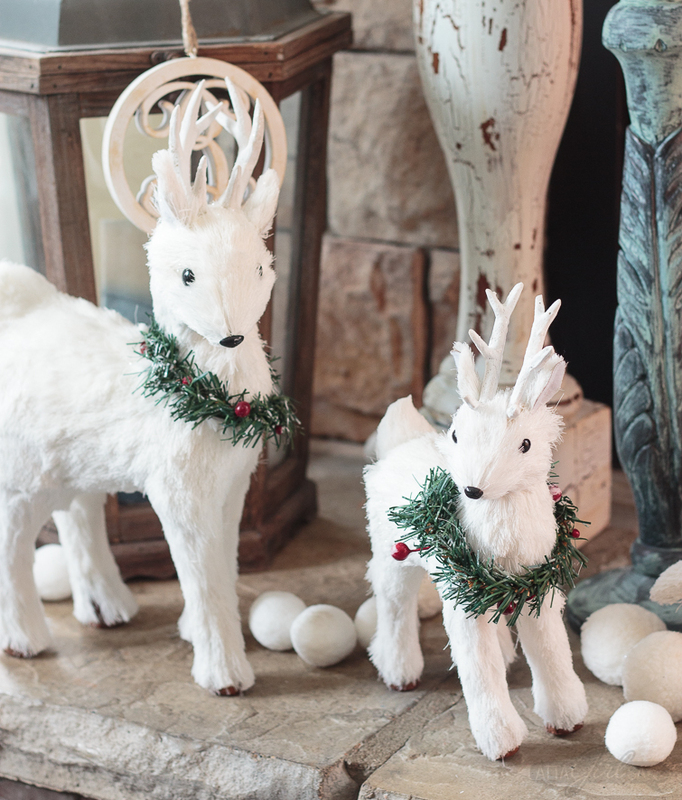 For the hearth, I also kept things simple with some white deer, silver bells and faux snowballs scattered about. 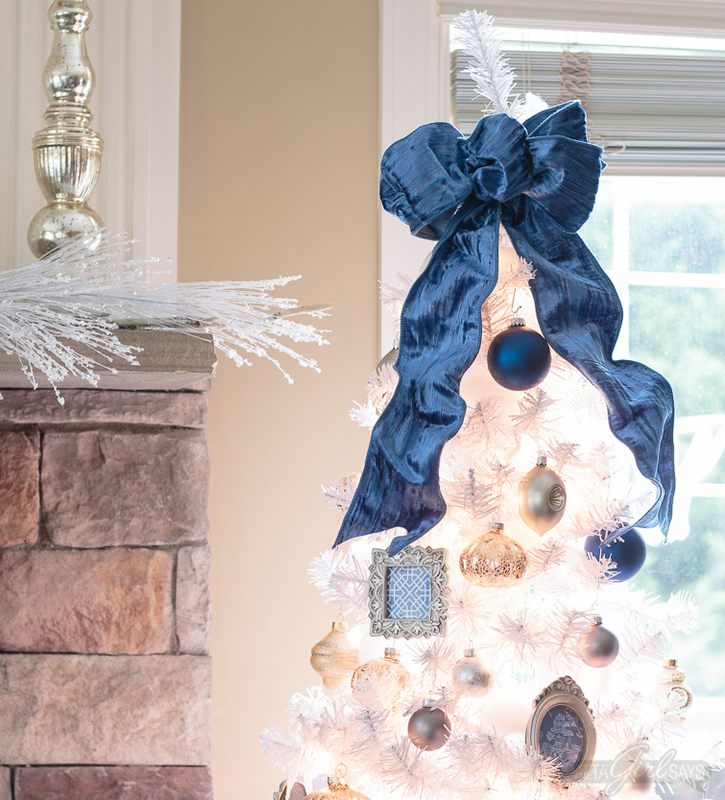 I thought I’d have any easy time finding blue decorations for our white tree, but I ended up having to hunt for them. I lucked upon the gorgeous blue velvet ribbon at a local store. 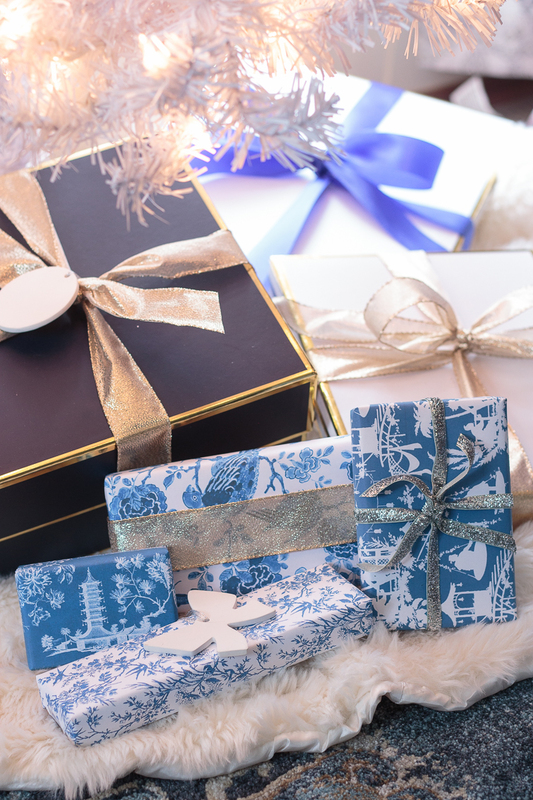 I made the chinoiserie ornaments using $1 frames and patterned paper. These were part of two digital scrapbook packs I bought on Etsy and printed myself. I did treat myself to a few chinoiserie ornaments from a local gift shop. I love this pagoda! That blue may be my new favorite color! I even raided my jewelry box to decorate this room. My brother brought me those beads from China years ago. 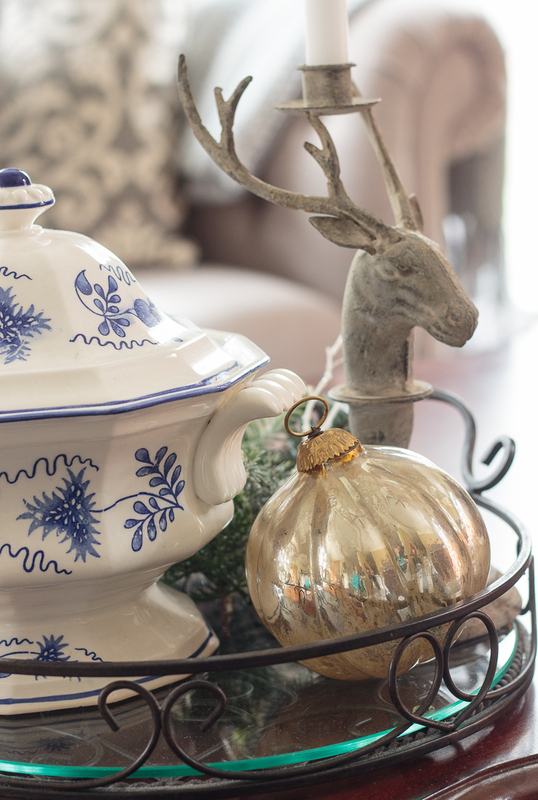 This soup tureen was my grandmother’s, and it’s always on the coffee table. 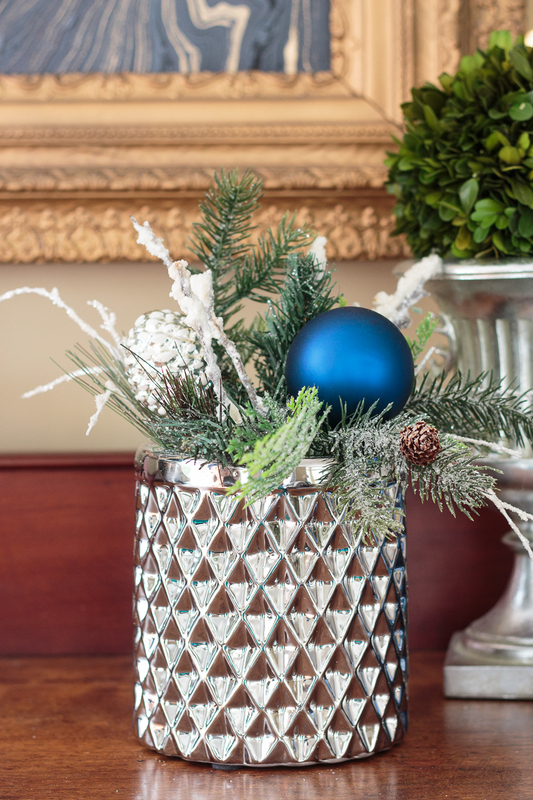 But I grouped it with an oversized ornament, some greenery and a rustic deer candlestick to give it a Christmas vibe. 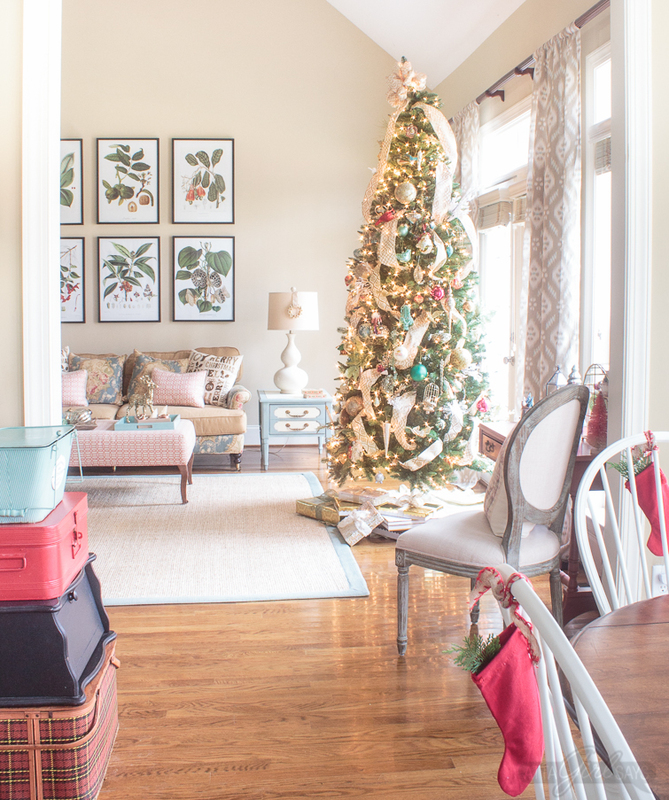 I hope you’ve enjoyed my Christmas home tour. 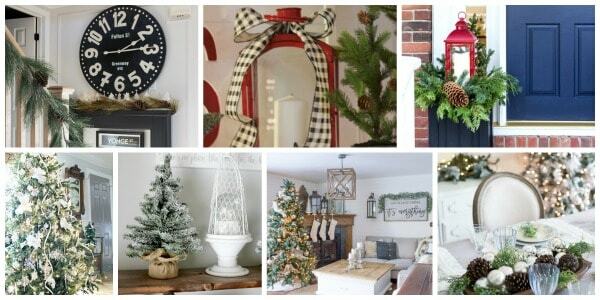 Head over to Seeking Lavender Lane next to see Deb’s gorgeous farmhouse style Christmas decor. 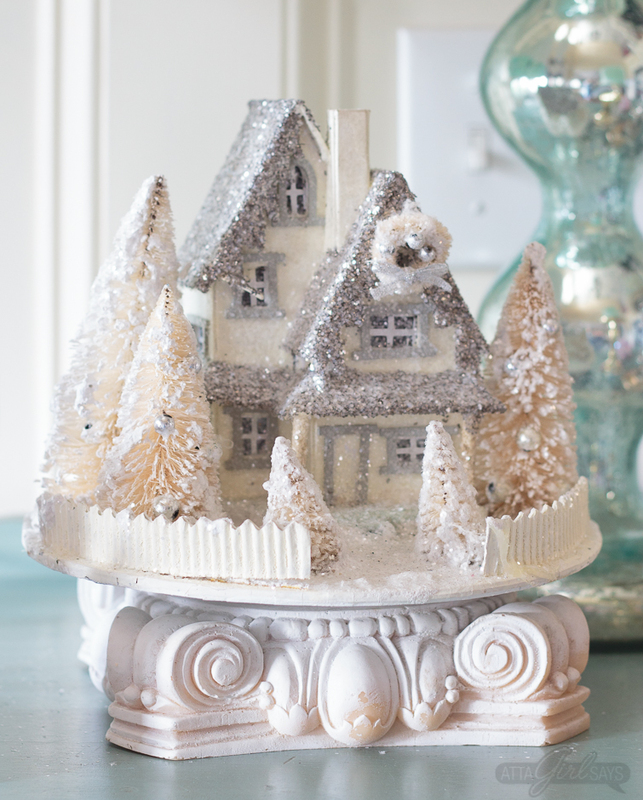 And don’t miss any of the other ladies on the Home for the Holidays Christmas home tour. Amy, your home is STUNNING!!!!! 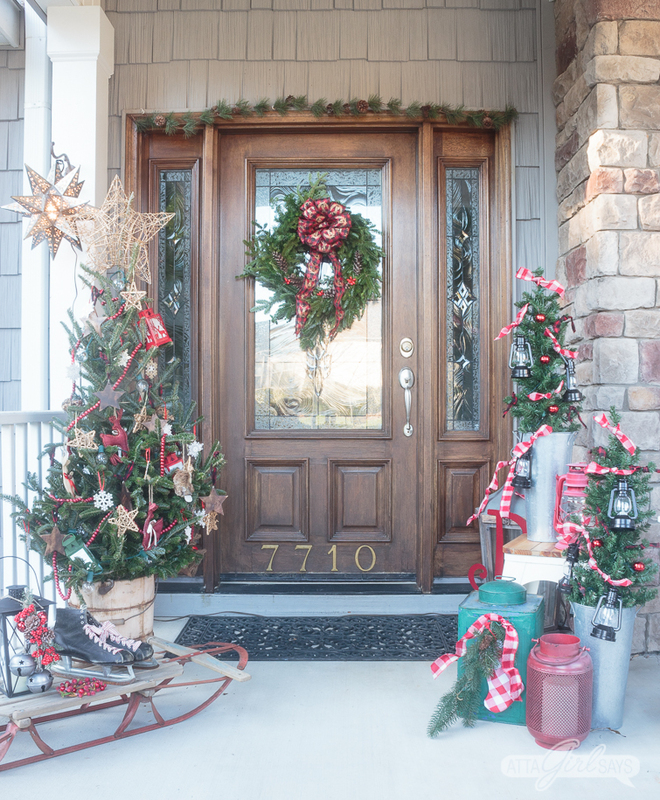 Your porch is beautiful and I love all of the colors you added to your home for the holidays! It is fun touring with you this week! Amy, your home is stunning! I love all the different colors you’ve used! 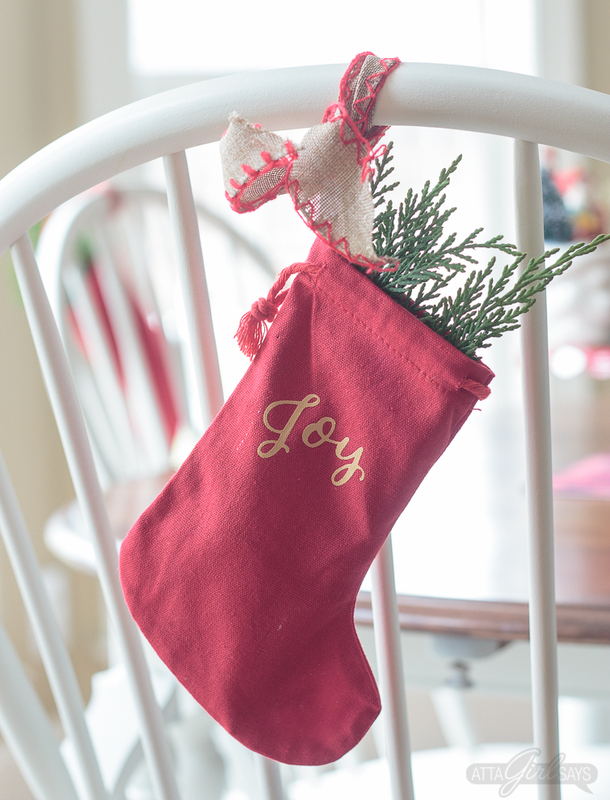 Merry Christmas and thank you so much for participating in this blog hop. It’s been so much fun! 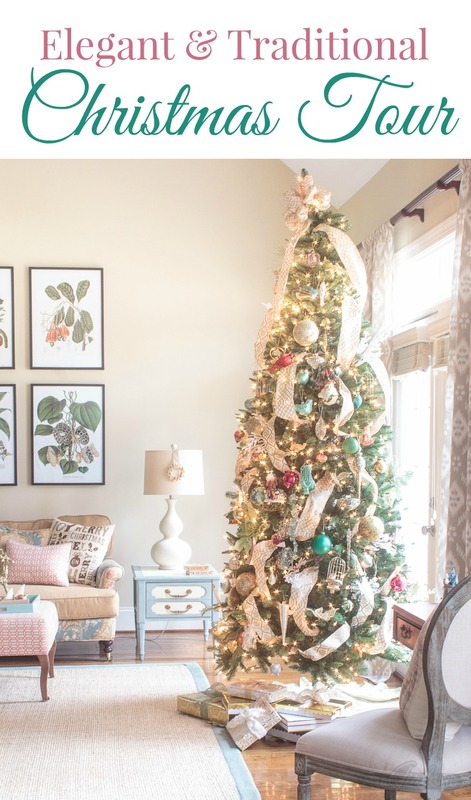 Everything is gorgeous, Amy I am obsessed with those vintage ornaments in your dining room . Love, love your home!! Can you tell me a source for your rug and draperies in the keeping room? I love the blue too. There were a hundred compliments floating through my mind but way too many to name now! Truly beautiful, Amy! 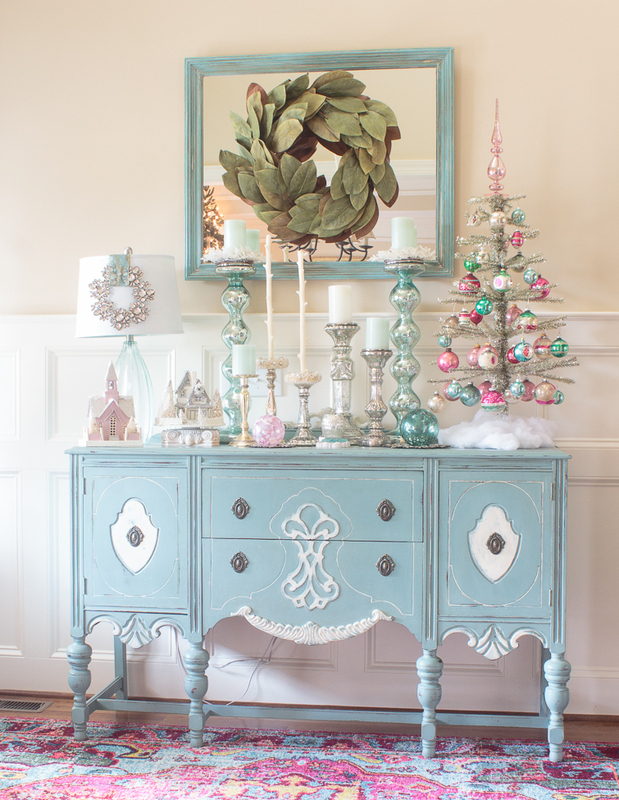 That buffet is styled so perfectly,! 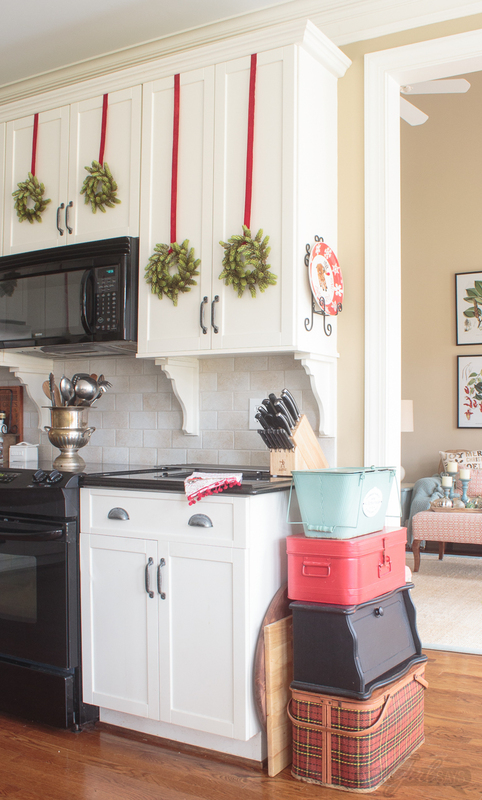 (Wondering where those little wreaths are from on your cupboards?) It was a pleasure to be on this tour with you! Aw, thank you so much Kendra. I bought those wreaths from a local store, Total Bliss, in Greensboro, N.C. They’re actually hops, as in the the thing used to make beer! 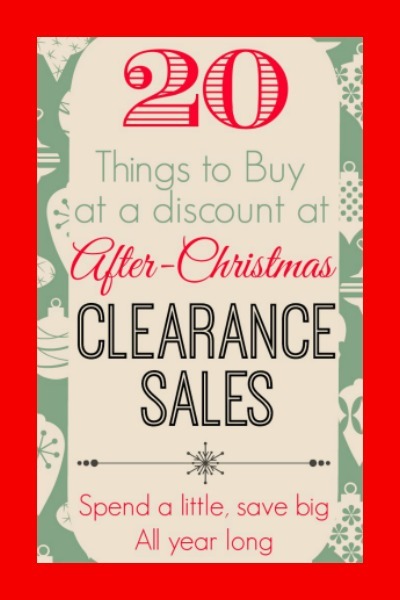 The owner of Total Bliss is wonderful, and I’m sure she’d be willing to special order and ship some wreaths to you. Your tour was wonderful! 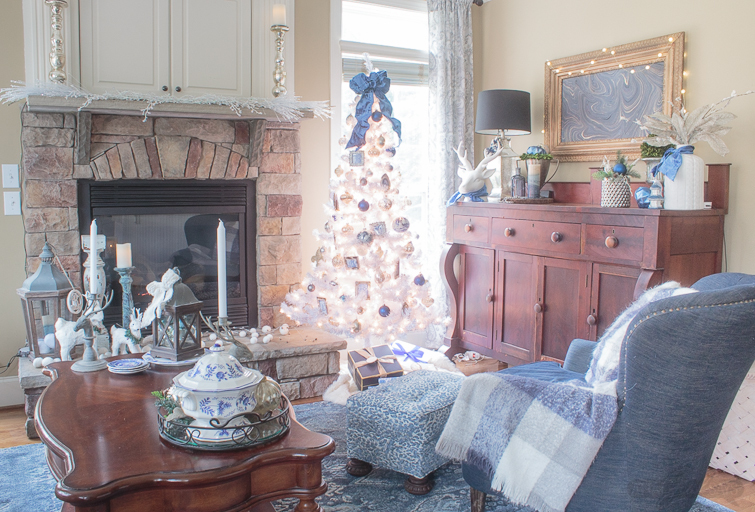 I love the tree with blue and touches of red. You’ve been very very busy! It has been a lot of work! I’m so tired! I don’t know how you guys do all the installations you do. I didn’t even get my banister decorated this year, even though I have that beautiful garland from you guys. Next year, I’ll start sooner. AMy, every room in your home is so elegant. 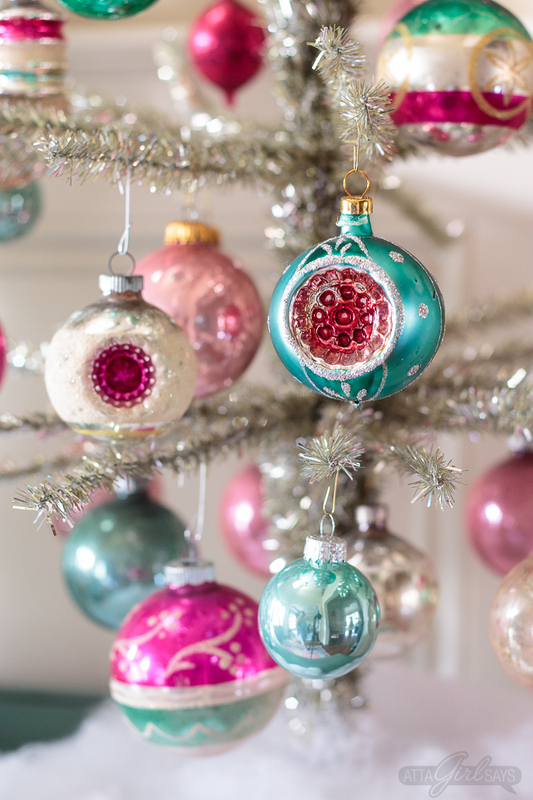 Love the bright pastel ornaments on the trees and elsewhere. It’s lush, it’s inviting, it’s beautiful. 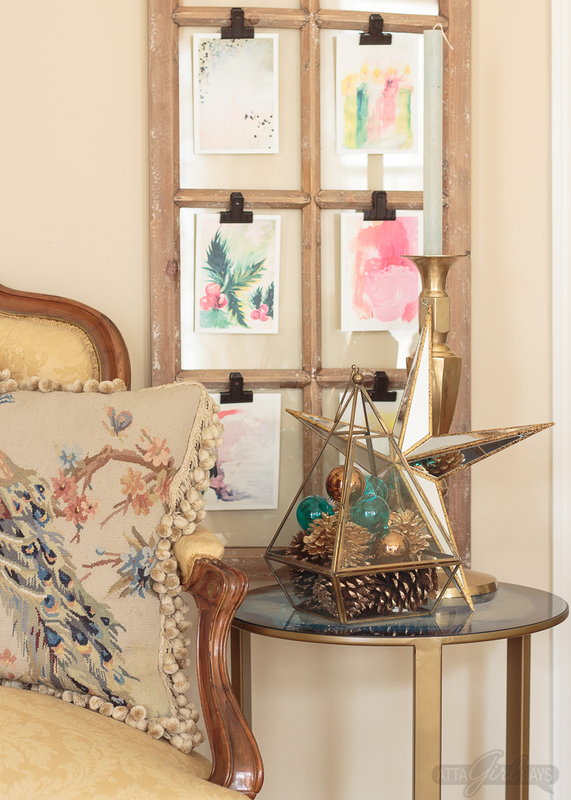 I can’t stop pouring over all the details of this home tour! 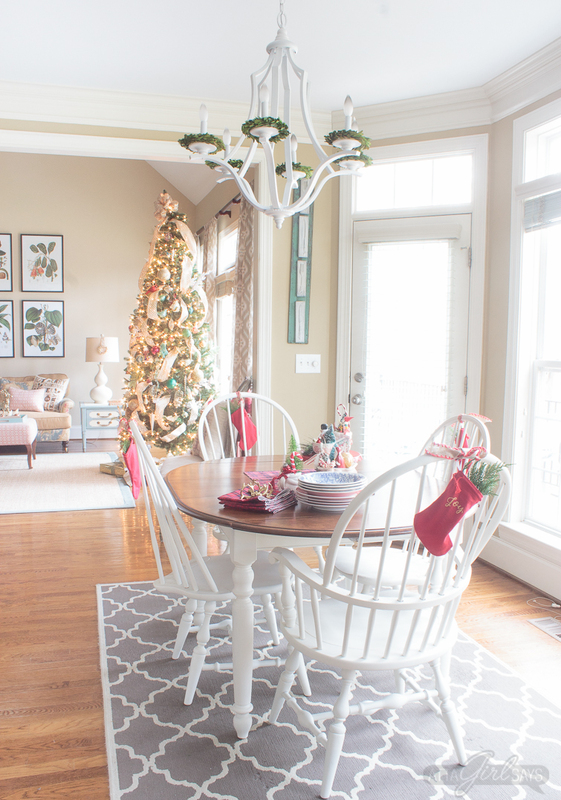 From the front porch to the dining room – the whole kit and caboodle is leaving me swooning! Love your style! WOW! WOW! WOW! I love everything about this! Your attention to detail is fabulous. I’m pinning this for next year! 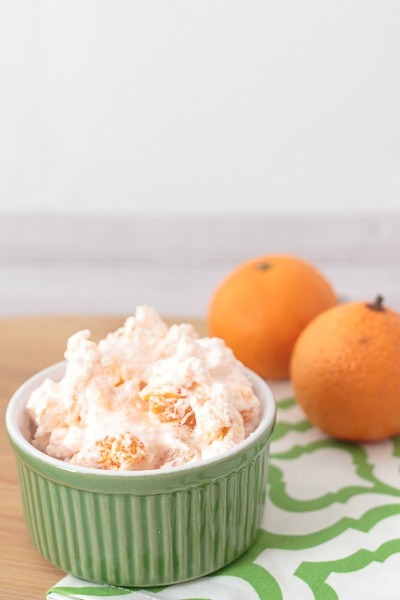 Totally swoon-worthy! Your porch!!!!! And those pink and green shiny brites are perfect!! !